2 bedrooms, 1 bathroom, living room, kitchen/dining, balcony. MW, DW, W/D, Cable TV, WiFi/DSL. POOL PRIVILEGES @ DAYS INN. BEDS: 1 Queen, 2 Single, sofa bed. Accommodates 6. NO PETS, NO SMOKING. We enjoyed our stay at Atlantic Breeze. The location of the apartment near the ocean is perfect. The apartment is functional, though dated. The only real negative is the weak water stream in the shower. comfortable, casual and lovely location. Balcony was so nice and spacious with a good view. Even had some deer come visit in the evening. Actually they were looking for food so renters may be feeding them! Great rental find on JI. Will return. 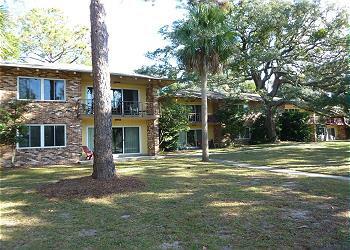 We love Jekyll Island and have been staying in these apartments for almost 50 years. We love the feel of the apts, the closeness to the beach and the spaciousness. I dont, however, like the name change. They will always be ocean terrace to me. The only isses we had was the table in the queen bedroom had a broken leg, the kitchen chairs had broken pieces and the shower needs a new shower head, it was painful to shower. But overall, we enjoyed it as usual. Jekyll Realty is always a pleasure to deal with as well. We Love Jekyll and love staying at Ocean Terrace. We will definitely be back! What more do you need? This simple apartment was very comfortable, clean, and super close to one of the best stretches of beach on Jekyll. My family of five had a great time here and will be back as soon as we can! We have been at this location for several years at the same time of year. Rental has been up graded and improvements continue, new locks new roof new pictures new chairs etc.. Adequate accomodations close to the beach. Hi! We have stayed at thsi location 3 times and we like it. It is an older building and the apartment is not updated but it is perfectly adequate. We are pleased with the place and its location. If you want the latest furniture styles, appliances and decor, this is not what you want but if you are OK with and older place this apartment will do just fine.